Baal Kadmon’s “Jinn Magick” | Spell Hub. Brining the occult to life. Created by God from “smokeless flame” according to the Quran, Jinn are a unique species that inhabit an unseen dimension parallel to our own. The word “jann” is the root Arabic word from which jinn is derived and it means “hidden” or “concealed”. Along with humans and angels, jinn are said to be one of three sapient creations of God and they are believed to have free-will, which allows them freedoms much like those of human beings. Although in Western culture jinn are sometimes thought to be akin to demons, they actually can be either “good” or “evil” in traditional Islamic theology. Also, while they are invisible to man, they are believed to be able to interact in a tactile manner with humans or objects in the physical world. In the book Jinn Magick by renowned occult author and teacher, Baal Kadmon, a detailed introduction to the world of the jinn is given. He also uncovers his secrets to evoking jinn and binding them so that they might do your bidding, and this is all done through very simplistic rituals. Kadmon is well known in the occult world for his no-frills teaching methods. Unlike some other occultist, he does not have a title and does not wear robes or use a lot of paraphernalia during his rituals. 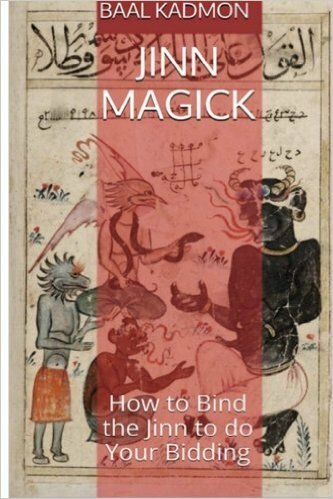 His practical, straightforward approach to magick is thought to be extremely refreshing for many occult practitioners and magicians, both new and experienced. Baal Kadmon explains in Jinn Magick that the jinn are unlike any spiritual beings that he has worked with in the past. They are extremely powerful and notorious for being pranksters. As Kadmon recounts his personal experiences with evoking jinn, he even expresses his surprise at how “in your face” the energy seemed to be. Even for experienced occultists, he cautions that you should take great care and show respect when calling upon jinn. Kadmon details five major classes of the most common jinn in his book, although he states that there are many more. The Efferit, the Marid, the Ghoul, the Vetala, and the Sila are featured in Jinn Magick and described thoroughly. He also itemizes the things that are needed to perform the rituals. Many times Kadmon’s rituals can be performed with specific items being optional, although he explains when conjuring jinn that the items listed in the book are quite necessary. However, most can be inexpensively purchased online or even at your local new age bookstore. They include things such as candles, incense, and various crystals. Jinn Magick includes 7 jinn rituals that are spelled out in detail. Each procedure is simple to perform even for the most inexperienced magician and promises to great benefit the practitioner in very specific ways. The rituals call upon the jinn to assist in healing, bestowing psychic powers, for protection, for mind expansion (gaining insight), general financial gain, finding love or lust, and to conquer enemies. The rituals are designed to be very similar to one another for the sake of ease. However, the author adds personal insights into each one, so even if a specific ritual doesn’t apply to your needs it is still worth reading. As someone who is interested in building upon my magickal knowledge, I found all of the rituals to be very interesting and educational, and I believe that anyone interested in the occult would agree. While it is advised to be careful when summoning jinn, it can be very beneficial as well. Kadmon simply cautions in the book to “be careful what you ask for because you just might get it” and it may not be what you expected at all. For more information about Baal Kadmon visit his website at http:/baalkadmon.com.